I know I’ve told you all before I love Thai food. Like OMG I can’t get enough of it L-O-V-E it. Multiple that love for it by approximately 5 million and that’s how much I loved it when I was pregnant with the Goose. It was kind of bad. I ate Panang curry for breakfast. I did that a lot. Well, not that long ago we took the Goose to the shore- Cape May, New Jersey to be exact. We have have been going to Cape May for years. In fact, we got married and spent our honeymoon there. Over the years, we found an Asian place there that we loved. We used to joke about how it’d be a problem when I got pregnant because more than likely I’d crave that food. We weren’t that far off. Sadly, when we went to Cape May earlier this year, we found our spot had closed. A new Asian restaurant had opened in its place. Close, but just not the same. We decided to give it a try, hoping that the restaurant’s name just changed. Nope. It was an entirely new experience. It was ok, but definitely not craving worthy. I order Thai fried rice, which I normally really like. It was just sort of there. Now, in fairness, I don’t know if I was just clouded by my disappointment that our place was no longer OUR place or if the Thai fried rice was actually kind of bland and disappointing. I suspect it was a combination of the two. As I was eating the sad Thai fried rice, I decided to give making my own take on Thai fried rice a try. In some weird way, I felt like I had to. It was sort of a tribute to the old place. I was sort of hesitant to do try making an actual Thai dish at home. I’ve tried and failed many times mainly when I was pregnant. My Thai food fails really set off my inner crazy pregnant lady. There may have been at least one instance where I cried over really bad failed pad Thai. 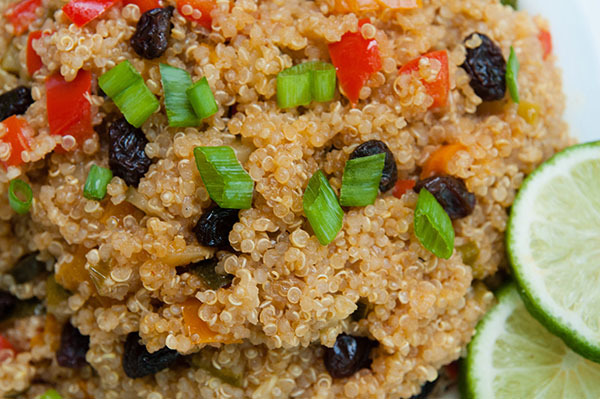 I’m so glad to report that this Thai fried quinoa bowl turned out awesome. All the studying eating of Thai food paid off. 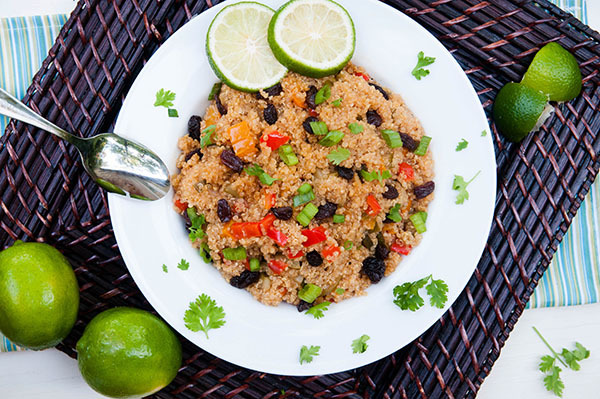 These Thai fried quinoa bowls have the perfect balance of lightly sweet flavor from coconut and a touch of brown sugar and spicy flavor from siracha all complimented by a hint of lime. I love these Thai fried quinoa bowls. L-O-V-E them. They were so easy and they are healthy. 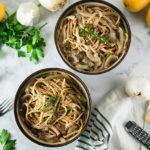 As I made them, these bowls are 100 percent vegan and gluten free. Better yet, they are full of healthy protein from the quinoa and chock full of seasonal fresh veggies. I felt really good about eating them. Good enough to have extra dessert afterwards. Plus these bowls are fast. 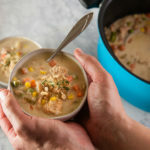 One pot, 30 minutes. Done. 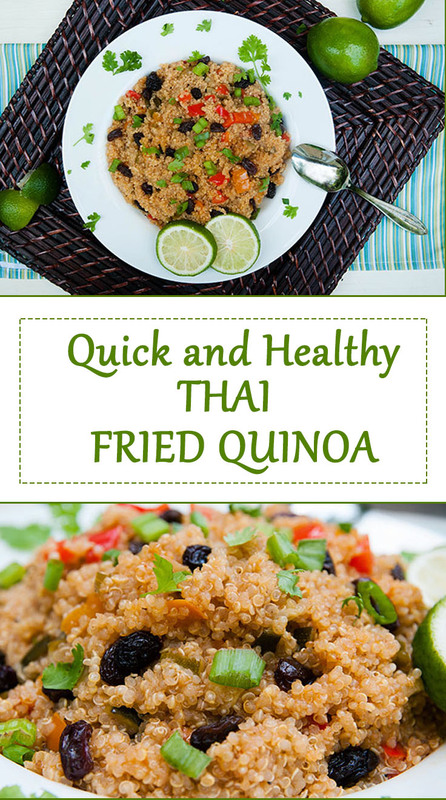 Best yet, this Thai fried quinoa is so flexible. They give options. Want to go more traditional with them and use rice? Go ahead, no problem. Don’t like the veggies in it. Go ahead and sub out your favorites or whatever is in season. 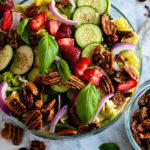 Need some meat or seafood and don’t want to have a vegan meal? That’s cool. Add some. But, if you have a toddler at home, make sure you keep the lime. Goose was quite entertained by the lime for a really long time. And that, my friends, is reason enough to make and enjoy these bowls. Heat a medium pot with a tablespoon of coconut oil over medium heat. Dice the veggies and add them to the pot. Stir. Add 3 cups of coconut milk and the quinoa to the pot. Continue to cook over medium heat until the quinoa is boiling. 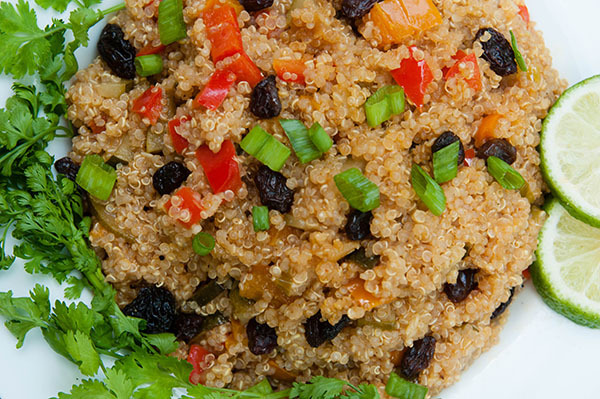 Turn heat down to let quinoa simmer. Continue to simmer for 20-25 minutes, adding water if necessary. Remove from heat and stir in brown sugar, tamari, curry, ginger, and pineapple. 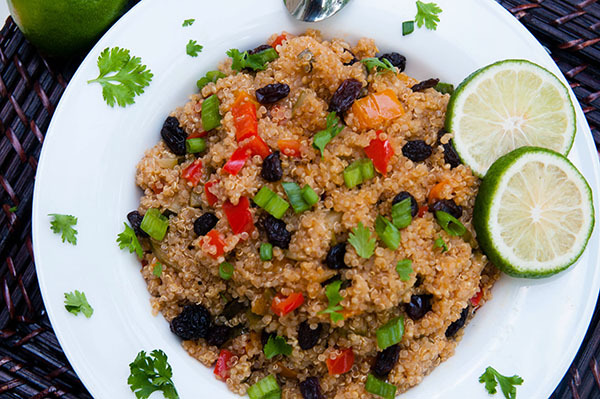 Serve in bowls and garnish with raisins, chopped cilantro, and chopped scallions. These look soo good! 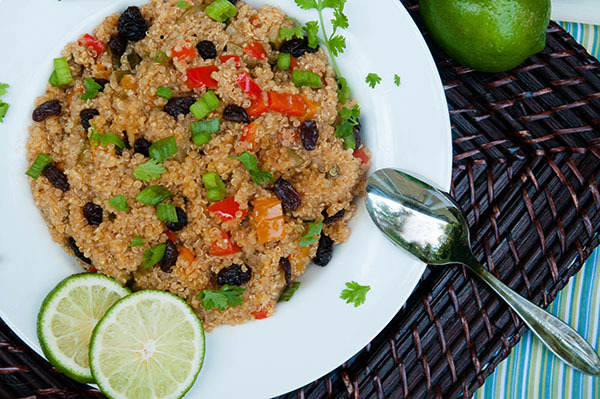 I love cooking with quinoa – it’s so versatile! 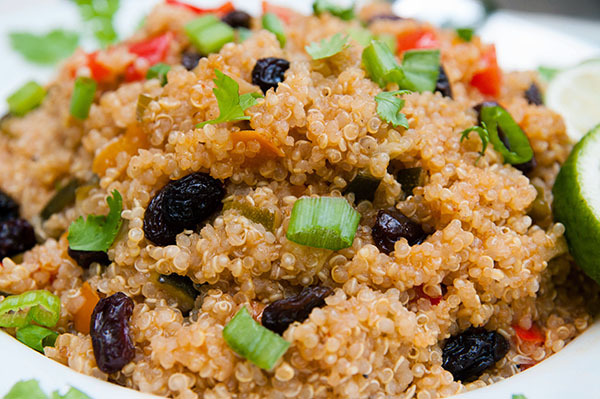 Quinoa is the best! You can do so much with it! This looks great! I love Thai food and this one’s very healthy. This sounds pretty good and relatively healthy. I think I’m going to have to try it. This looks too yum! And don’t worry, I’ve preggo cried over burnt cookies. Haha! Lol! I totally preggo cried when I ruined my pad Thai. I’m glad I’m not alone! 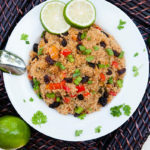 Thai food is my husband’s favorite and we’re both crazy about quinoa – this looks like the perfect recipe for us! Yes! If you like Thai try this! It’s easy and was pretty spot on to what you’d get in a Thai restaurant. This looks so good! I love that you included raisins! YUM! 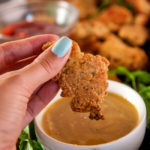 Yum, need to try this recipe! I love quinoa!! !